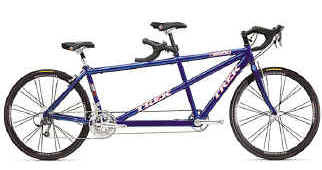 Our newest tandem is a 2007 Trek T2000 with Project One paint. It is an aluminum bike with a carbon fork, rear Avid BB7 disk brake, and 24º Bontrager tandem wheels. 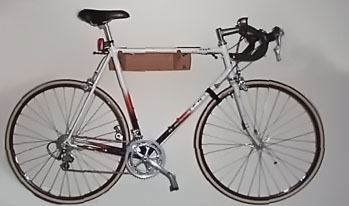 We bought it to replace our 2002 Trek T2000 mainly because the disk brake mount was moved from the seatstay to the chainstay, making it possible to mount a standard rear rack when we go on tour. The new Trek handles a little faster than the old one and took a little getting used to. Between the redesigned frame, carbon fork, and Bontrager BzzzKill bar end plugs, the new bike is also a lot smoother on rough pavement than the old one. 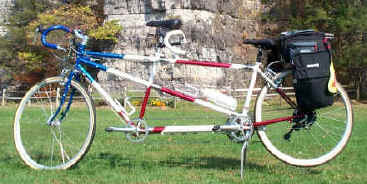 From 2002 to 2007 our main tandem was a 2002 Trek T2000 as pictured here. We have a matching set of 2005 Novara Fusions. These city bikes have Shimano Nexus rear hubs with 8 internal gears, one battery powered headlight, and a headlight and tail light powered by a Shimano generator front hub. They came decked out with fenders and rear racks, and they are surprisingly fun to ride for short trips to the store. 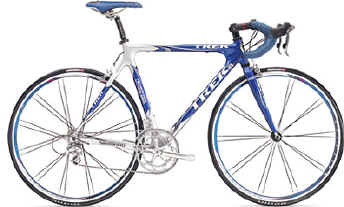 This is my road bike, a Trek 5200 in U.S. Postal Team colors. It is awesome, but I still can't ride like Lance. I really am faster on this than my old road bike. Maybe the cool-looking aero wheels have something to do with it, but a big factor is that this bike is rock-solid on descents, so I can let gravity do it's magic. My old road bike didn't inspire confidence at speed, so I wouldn't let it run 'wide open' on the downhills. So far I've topped out at only 49 mph. 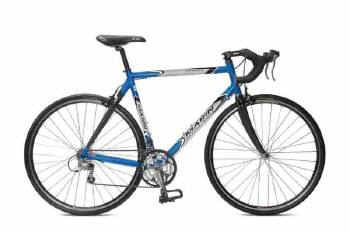 Dawn's road bike is a 41cm 2004 Marin Venezia. This small frame size is built with 650c (570mm) wheels and doesn't have the carbon seatstays pictured here. We had to buy this bike when it was offered to us at a price we couldn't refuse by a shop that had special ordered it for a rider who turned out to need a larger frame. Dawn's other bike is a 1999 Terry Flora with 24" wheels. Terry Bicycles uses smaller wheels to allow them to build bikes for shorter riders while maintaining normal handling characteristics. This is my old road bike. It is a 1994 Raleigh SP2000 with 8 speed Dura Ace STI components. 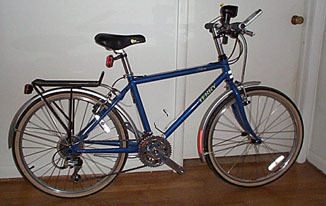 The frame of the bike is made of three different materials. The 3 main tubes are metal matrix (a combination of aluminum and ceramic), the lugs are aluminum, and the fork and rear triangle are Reynolds steel. I didn't ride it much for several years, but have now started to get back into groups rides with the Potomac Pedalers Touring Club. Now that I have the Trek 5200, this bike is used on my Tacx trainer during the off season.